Europe's next mission to Mars has passed a key milestone to enter its final construction phase in pursuit of a planned 2016 launch toward the Red Planet. European Space Agency officials signed the last construction contract for the 2016 ExoMars mission today (June 17), a deal between ESA and the Mars orbiter's prime contractor Thales Alenia Space. 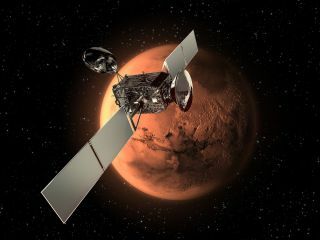 The ExoMars orbiter mission aims to send a methane-sniffing orbiter and a landing demonstrator to the Red Planet. "The award of this contract provides continuity to the work of the industrial team members of Thales Alenia Space on this complex mission, and will ensure that it remains on track for launch in January 2016," Alvaro Giménez, ESA's director of science and robotic exploration, said in a statement. The ExoMars mission, a partnership between ESA and the Russian space agency Roscomos, aims to search for signs of past or present life on Mars. Two launches are planned, one in 2016 and another two years later. The 2016 portion of the mission includes two main components — the Trace Gas Orbiter, which will hunt for methane and other atmospheric gases that could be produced by lifeforms on the Red Planet; and the Entry, Descent and Landing Demonstrator Module, which will prove out technologies needed for the 2018 phase and future Mars missions. The main piece of the 2018 launch is a rover capable of drilling 6.6 feet (2 meters) into the Red Planet dirt. Scientists are keen to collect samples from such depths, which are sheltered from the cold, dry and radiation-bombed Martian surface. The new contract with Thales Alenia Space is worth about 230 million euros ($307 million at current exchange rates), Space News reported. ESA's financial obligation for the entire two-launch ExoMars mission is 1.2 billion euros ($1.6 billion), agency officials have said. ExoMars was originally conceived as a partnership involving ESA and NASA, but budget cuts led to the U.S. space agency's withdrawal from the project in 2012. Roscosmos filled NASA's shoes earlier this year, coming onboard to provide science instruments and other mission components, including the rockets for both launches.